A rose is a flowering shrub of the genus Rosa. There are more than a hundred species of wild roses, which are endemic (native) only to the Northern Hemisphere. The term is also used to refer to the flower of this shrub. Roses are members of the family Rosaceae, which is one of the largest families of flowering plants with about 3,400 species including apples, berries, peaches, plums, cherries, the hawthorn tree, the mountain ash, and many others. Few plants have had such a hold on the human imagination as the rose. The value of a rose is not so much in its fruit—although, the fruits have some nutritional and commercial value. Rather, the chief value of a rose comes in its being a symbol of love and beauty. It appears in art, is exchanged as a symbol of love, its fragrance is captured in perfumes, and it adorns gardens and public spaces. Shakespeare captured some of the rose’s poetic use in Sonnet 54, drawing analogy with the person's true value being his or her virtue, which survives even after the person is gone (“the rose looks fair, but fairer we it deem for that sweet ordour which doth in it live”). In the song, The Rose, the rose symbolizes hope: "Just remember in the winter, far beneath the bitter snow, lies the seed that with the sun’s love, in the spring becomes the rose." The name "rose" originates from Persian vrda, via Greek rhodon "rose" (Aeolic wrodon). Wild roses form a group of generally thorny shrubs or climbers, and sometimes trailing plants, reaching 2 to 5 meters (6 to 18 feet) in height, rarely reaching as high as 20 meters (65 feet) by climbing over other plants. The leaves of most species are 5 to 15 cm (2 to 6 inches) long, pinnate, with three to thirteen leaflets and basal stipules; the leaflets usually have a serrated margin and often a few small thorns on the underside of the stem. The vast majority of roses are deciduous, but a few (particularly in Southeast Asia) are evergreen or nearly so. The flowers have five petals (with the exception of Rosa sericea which often has only four), usually white or pink, in a few species yellow or red. The ovary is inferior, developing below the petals and sepals. 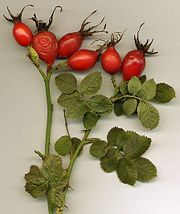 The fruit of the rose is a berry-like structure called a rose hip. The hips of most species are red, but a few (e.g. Rosa pimpinellifolia) have dark purple to black hips. Each hip comprises an outer fleshy layer, the hypanthium, which contains 5 to 160 "seeds" (technically dry, single-seeded fruits called achenes) embedded in a matrix of fine, but stiff, hairs. Rose hips of some species, especially the dog rose (Rosa canina) and rugosa rose (Rosa rugosa), are very rich in vitamin C, among the richest sources of any plant. The hips are eaten by fruit-eating birds such as thrushes and waxwings, which then disperse the seeds in their droppings. Some birds, particularly finches, also eat the seeds. People also sometimes eat rose hips, mainly for their vitamin C content. They are usually pressed and filtered to make rose-hip syrup, as the fine hairs surrounding the seeds are unpleasant to eat (resembling itching powder). They can also be used to make herbal tea, jam, jelly, and marmalade. During the Second World War, rose hips were an important source of vitamin C in Great Britain when other fruits were scarce. Most roses have thorns or prickles. The thorns are typically sickle-shaped hooks, which aid the rose in hanging onto other vegetation when growing over it. Some species, such as Rosa rugosa and R. pimpinellifolia, instead have densely packed straight spines, probably an adaptation to reduce browsing by animals, but also possibly an adaptation to trap wind-blown sand and so reduce erosion and protect their roots (both of these two species grow naturally on coastal sand dunes). Despite the presence of the thorns, roses are frequently browsed by deer. A few species of roses only have vestigial thorns that have no points. There is significant disagreement over the number of true rose species. Some species are so similar that they could easily be considered variations of a single species, while other species show enough variation that they could easily be considered to be different species. Lists of rose species usually show between 100 and 150 with most botanists agreeing that the actual number is probably nearer the lower end of that range. Hulthemosa (formerly Simplicifoliae, meaning "with single leaves") containing one or two species from Southwest Asia, R. persica and R. berberifolia (syn. R. persica var. berberifolia), which are the only roses without compound leaves or stipules. Platyrhodon (from the Greek for "flaky rose," referring to flaky bark) with one species from East Asia, R. roxburghii. Rosa the subgenus containing all the other roses. The subgenus Rosa is subdivided into 11 sections. When we had looked well at all of this, we went to the orchard and garden, which was such a wonderful thing to see and walk in, that I was never tired of looking at the diversity of the trees, and noting the scent which each one had, and the paths full of roses and flowers, and the many fruit trees and native roses, and the pond of fresh water. Rose cultivation increased in popularity in the fifteenth and sixteenth centuries, especially in Holland, when trading ships brought rose bushes from China. These were crossed with European roses creating many new varieties. The popularity of roses never slowed down and continues today. In 1994, over 1.2 billion roses were purchased by U.S. flower buyers; 4.67 per person. In three national public opinion polls between 1975 and 1986, over 85 percent of Americans named the rose as their favorite flower . 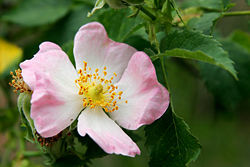 Wild Roses – The wild roses includes the species listed above and some of their hybrids. Alba – Literally "white roses," derived from R. arvensis and the closely allied R. alba. These are some of the oldest garden roses, probably brought to Great Britain by the Romans. Once-flowering. Examples: "Semi-plena," "White Rose of York." Gallica – The Gallica roses have been developed from R. gallica which is a native of central and southern Europe. They flower once in the summer. Examples: "Cardinal de Richelieu," "Charles de Mills," "Rosa Mundi" (R. gallica versicolor). Damask – Robert de Brie is given credit for bringing them from Persia to Europe sometime between 1254 and 1276. Summer damasks (crosses between Gallica roses and R. phoenicea) bloom once in summer. Autumn damasks (Gallicas crossed with R. moschata) bloom later, in the autumn. Examples: "Ispahan," "Madame Hardy." Centifolia (or Provence) – These roses, raised in the seventeenth century in the Netherlands, are named for their "one hundred" petals. Once-flowering. Examples: "Centifolia," "Paul Ricault." Moss – Closely related to the centifolias, these have a mossy excrescence on the stems and sepals. Once-flowering. Examples: "Comtesse de Murinais," "Old Pink Moss." China – The China roses brought with them an amazing ability to bloom repeatedly throughout the summer and into late autumn. Four china roses ("Slater's Crimson China," 1792; "Parsons' Pink China," 1793; "Hume's Blush China," 1809; and "Parks' Yellow Tea Scented China," 1824) were brought to Europe in the late eighteenth and nineteenth centuries, which brought about the creation of the repeat-flowering old garden roses and later the modern garden roses. Examples: "Old Blush China," "Mutabilis." Portland – These are named after the Duchess of Portland who received (from Italy in 1800) a rose then known as R. paestana or "Scarlet Four Seasons' Rose" (now known simply as "The Portland Rose"). This group was developed from that rose. Repeat-flowering. Example: "James Veitch," "Rose de Rescht," "The Portland Rose." Bourbon – They originated on l'Île de Bourbon (now called Réunion). Probably the result of a cross between the autumn damask and the "Old Blush China." Introduced in France in 1823. Repeat-flowering. Examples: "Louise Odier," "Mme. Pierre Oger," "Zéphirine Drouhin." Hybrid Perpetual – The dominant class of roses in Victorian England, they were derived to a great extent from the Bourbons. Repeat-flowering. Examples: "Ferdinand Pichard," "Reine Des Violettes." Tea – The result of crossing two of the original China Roses ("Hume's Blush China" and "Parks' Yellow Tea Scented China") with various Bourbons and Noisette roses. Somewhat more tender than other old garden roses (most likely because of R. gigantea in the ancestry of the Parks rose), teas are repeat-flowering roses, although their fragrance is not always a tea scent. Example: "Lady Hillingdon." Bermuda "Mystery" Roses – A group of several dozen "found" roses that have been grown in Bermuda for at least a century. The roses have significant value and interest for those growing roses in tropical and semi-tropical regions, since they are highly resistant to both nematode damage and the fungal diseases that plague rose culture in hot, humid areas, and they are capable of blooming in hot and humid weather. Most of these roses are likely old garden rose cultivars that have otherwise dropped out of cultivation, or sports thereof. They are "mystery roses" because their "proper" historical names have been lost. Tradition dictates that they are named after the owner of the garden where they were rediscovered. 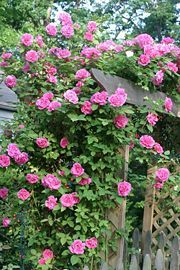 Miscellaneous – There are also a few smaller classes (such as Scots, Sweet Brier) and some climbing classes of old roses (including Ayrshire, Climbing China, Laevigata, Sempervirens, Noisette, Boursault, Climbing Tea, and Climbing Bourbon). Those classes with both climbing and shrub forms are often grouped together. Hybrid Tea – The "long stem" rose. Most roses sold by florists and at roadside flower stands are Hybrid Teas. They typically have one to at most five or six large flowers per stem, the flower with numerous tightly arranged petals with reflexed tips (see photo, right). They are favored in small gardens in formal situations, and for buttonhole roses. Floribunda – Flowers are often smaller, in large clusters of ten or more (often many more) on each stem. These tend to give a more prominent display from a distance, so are more often used in large bedding schemes in public parks and similar spaces. The making of perfume from rose petals dates from ancient times and is a major industry today. Rose perfumes are made from attar of roses or rose oil, which is a mixture of volatile essential oils obtained by steam-distilling the crushed petals of roses. The technique originated in Persia (the word rose itself is from Persian), then spread through Arabia and India, but nowadays about 70 to 80 percent of production is in the Rose Valley near Kazanluk in Bulgaria, with some production in Qamsar, Iran, and in Germany. The Kaaba in Mecca is annually washed by the Iranian rose water from Qamsar. In Bulgaria, Iran, and Germany, damask roses (Rosa damascena 'Trigintipetala') are used. 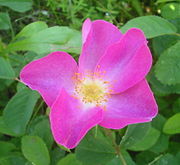 In the French rose oil industry, Rosa centifolia is used. The oil, pale yellow or yellow-gray in color, is sometimes called “Rose Absolute” oil to distinguish it from diluted versions. The weight of oil extracted is about one three-thousandth to one six-thousandth of the weight of the flowers—for example, about 2,000 flowers are required to produce one gram of oil. The main constituents of attar of roses are the fragrant alcohols geraniol, which have the empirical formula C10H18O and the structural formula CH3.C[CH3]:CH.CH2.CH2.C[CH3]:CH.CH2OH and l-citronellol; and rose camphor, an odorless paraffin. From ancient times, the rose has had a strong hold on the human imagination, most often as a symbol of love and beauty. In ancient times, roses were sacred to the goddesses Isis and Aphrodite. In India, it is believed that one of the wives of the god Vishnu was found inside a rose. Roses were very popular in the Roman Empire. Sometimes the floors of banquet halls were covered in rose petals. After the fall of Rome, roses fell on some disfavor in Europe and were not allowed to be brought into churches, although they were still grown for medicinal use. After a time, the rose's reputation was redeemed and it came to be associated with the Virgin Mary. Roses were carved in wood and stone and "rose windows" were created for church decoration. Prayer beads came to be known as "rosaries," perhaps because they were first made of rosewood and later of a paste of rose petals and salt, and also because of the rose's association with Mary. Since ancient China, roses have been the subject of art. The French artist Pierre-Joseph Redouté, the official court artist of Queen Marie Antoinette, produced some of the most detailed paintings of roses. Roses are so important that the word for rose also means pink or red in some languages, including Spanish, Greek, and Polish. Roses have been used as badges and symbols. England's Wars of the Roses were fought between the House of Lancaster, symbolized by a red rose, and the House of York, symbolized by a white rose. Today the rose is the national flower of England and the United States and the state or provincial flower of Yorkshire, Alberta, Iowa, North Dakota, Georgia, and New York. The rose came to symbolize the Republic of Georgia's non-violent bid for freedom during its Rose Revolution in 2003. There are a number of mythologies, folk legends, and superstitions that have developed regarding roses. Since the earliest times, the rose has been related to the issue of "silence." In Greek mythology, Eros presented a rose to the god of silence. In a Celtic folk legend, a wandering, screaming spirit was silenced by presenting the spirit with a wild rose every new moon. The phrase sub rosa or "under the rose" has the meaning of keeping a secret. This practice was derived from the ancient Roman practice of placing a wild rose on the door of a room in which a confidential discussion or meeting was being held. Among superstitions is the view that if rose leaves are thrown into a burning flame, it will give good luck, and that if a rose bush were pruned on St. John's Eve, it would be guaranteed to bloom in the autumn. This later superstition can be coupled with the Scottish legend that if a white rose bloomed in autumn, it was a token of an early marriage. Another belief is that if a young girl had more than one lover, she should take rose leaves and write the names of her lovers upon them before casting them into the wind. The last leaf to reach the ground would bear the name of the lover whom she should marry. In some pagan mythologies, no undead or ghostly creatures (particularly vampires) may cross the path of a wild rose. It was thought that to place a wild rose on a coffin of a recently deceased person would prevent him from rising again. The Peace rose is the most famous and successful garden rose of all time. Over one hundred million plants have been sold. It is a Hybrid Tea with very large flowers and a light yellow to cream color. It is very hardy and resistant to disease, making it popular in gardens as well as in the floral trade. Peter Beales, English rose grower and expert, said in his book Roses:: "'Peace', without doubt, is the finest Hybrid Tea ever raised and it will remain a standard variety forever."